Dr. Andrew Steinmann is the Distinguished Professor of Theology and Hebrew at Concordia University Chicago. At Concordia, he teaches a wide variety of classes, including Hebrew I and II, Hebrew Readings, Readings in Hebrew, and Introduction to the Old Testament. His research interests are focused on Hebrew, Aramaic languages, apocalyptic literature, wisdom literature, and biblical chronology. He is also an author, husband, father, and grandfather. We recently caught up with Dr. Steinmann to talk about life, writing, and his latest project, 2 Samuel, now available in the Concordia Commentary Series. Was there anything different for you when writing 2 Samuel from when you wrote 1 Samuel? There was not a lot of difference. Thanks to a sabbatical with additional funding from a grant from CPH, I was able to spend fifteen months writing on the entire Book of Samuel. When I finished 1 Samuel 31, I simply continued on into 2 Samuel 1. How does it feel to have the set complete? It is nice to see both volumes in print. Since 1–2 Samuel was originally one book, having the set allows the entire scope of the inspired author’s original work to be viewed through both volumes in the Concordia Commentary Series. How did you become interested in Samuel? While I had frequently taught a class on the Old Testament’s historical books and had worked through the chronological issues in the Book of Samuel when I wrote From Abraham to Paul, I was not deeply interested in Samuel until Chris Mitchell asked me about writing the Concordia Commentaries on 1–2 Samuel. However, I’m glad he persuaded me to take on this project, since I developed a greater appreciation for these books and even was able to publish an essay or two on various aspects of Samuel. How does commentary writing differ from writing other academic pieces? There are several things that make writing a commentary unique. With other academic pieces, one is able to focus on a single passage or perhaps a few selected portions of a biblical book or on particular aspects and themes of a biblical text. With a commentary, you don’t have that luxury. You must look at every passage and consider everything—Hebrew language issues, message of the text, what others have written on it, and so forth. Also, commentaries are not used like other books. Often they are references, and users will only be interested in reading about a particular passage instead of reading the book cover to cover. If a theme or feature appears several times in a biblical book, it often has to be discussed multiple times or the reader must be referred to pages where that feature is discussed. In addition, one’s research into the published literature must be broad and cover a lot of territory. That is why the bibliography in the 2 Samuel volume is thirty pages. What do you think is the most important biblical passage in Samuel? Without a doubt, 2 Samuel 7—God’s promise to David through the prophet Nathan—is the most important passage in the book. Here the messianic nature of the entire Book of Samuel finds its clearest expression and points readers to Christ. This passage is the basis on which the later prophets and the New Testament proclaim the Savior to be the Son of David. What do you hope pastors, students, and other readers will get out of 1 and 2 Samuel? I hope they will see that the Book of Samuel is not simply history about ancient Israel, but it is history written to show us God and His work in the lives of people. Therefore, it contains the message of God’s Word to be read, studied, and applied to our lives also. The lessons we learn in 2 Samuel of David’s great faith but also his serious failings show us God’s Law and Gospel at work in the life of Israel’s greatest Old Testament king. From this, we can see how the Scriptures speak also to us and our lives today. How does your work as a professor of theology and Hebrew help when writing these commentaries? Being given the privilege of teaching the Scriptures at the university level helps me grow with my students in understanding and applying God’s Word. Class discussions often stimulate further study of the Bible for me. In addition, a portion of my time as a professor is supposed to be spent in pursuit of scholarship—time given to me as part of my call to delve into specific questions about the Scriptures and then to share what I have learned with the church and the broader academy. What do you find most interesting about translating the Bible? Probably the most interesting part to me is exploring various aspects of Hebrew grammar—I know that’s a very nerdy answer, but for me it is a pleasure to spend time in the language of God’s ancient people and learn about how their language worked. Then, it is exciting to find ways of expressing their thoughts and words in contemporary English that, hopefully, is just as meaningfully expressed for readers today. It’s hard to pick out one. If I can confine it to the topic of the Christian faith, I’d say it was the advice I was given by my pastors and by my professors at seminary—know the catechism, study it, and take its words to heart. Here you find the basics of God’s message to us, and it will always point you to Christ. Professionally, I’ve been named to the editorial board of The Journal of the Evangelical Theological Society, so I’ve got plenty to do. That does not mean that I won’t be writing for CPH. I would like to be able to do that also sometime in the future. I hope to work for several more years and continue to teach before considering retirement. Personally, my wife and I continue to look forward to engaging in our two favorite activities: travel and bird watching. We have future trips planned around the U.S. and to Germany for us and our children and grandchildren. The history of the Church—and in particular, the Reformation of the sixteenth and seventeenth centuries—is a fascinating subject of study. A period of tumultuous events and passionate debate, the Reformation introduced the world to a host of influential characters. And while individuals such as Martin Luther, John Calvin, and Thomas Cranmer stand out prominently in this period, there are certainly other, though perhaps lesser-known, characters who left their own significant marks on history. John Frederick the Magnanimous was one such character. Concordia Publishing House will release John Frederick the Magnanimous: Defender of Martin Luther and Hero of the Reformation in January 2018. This biography of the Saxon elector who ruled from 1532 to 1547 is the first-ever English translation of Georg Mentz’s original biography of John Frederick. Featuring abundant coverage of the elector’s life and the political issues he faced, this biography also provides useful background for the study of Luther’s later years, as well as a description of the Smalcald War following Luther’s death. Rev. John T. Pless is assistant professor of pastoral ministry and missions at Concordia Theological Seminary in Fort Wayne, Indiana, and is a visiting professor at Lutheran Theological Seminary in Pretoria, South Africa. He is also the author of Handling the Word of Truth: Law and Gospel in the Church Today, Praying Luther’s Small Catechism, and Martin Luther: Preacher of the Cross. He is also the co-editor of Closed Communion? and The Necessary Distinction. We recently caught up with Pless to talk about The Necessary Distinction, which is now available on cph.org. Why is it important to make a clear distinction between Law and Gospel? We distinguish between God’s Law and His Gospel because the Scriptures make this distinction. This is not a distinction superimposed on the Bible; rather, it flows from the fact that God speaks two different words to us in the Holy Scriptures. God speaks both commands and promises. It is important that the Law be distinguished from the Gospel for three reasons. First, so that Christ Jesus alone is trusted in for salvation, not our own good works. Second, the distinction between the Law and the Gospel clarifies the two ways that the triune God is working in the world. Through the Law, God is restraining the effects of sin in creation. Through the Gospel, He is forgiving sin and enlivening forgiven sinners to live before Him by faith. Third, Law and Gospel are to be rightly distinguished for the sake of articulating God’s message of salvation to unbelievers. We need to be clear that salvation is through faith in the promises of Christ Jesus and not in our own moral or spiritual achievements. Where the distinction between Law and Gospel is not made, people will fall into the trap of “lawfulness” or “lawlessness.” They will either believe that they are righteous because they have kept the Law, or they will set God’s Law aside and live by their own standards. What impact does it have on an individual Christian if the two are not properly distinguished? Where Law and Gospel are confused, individual Christians are caught in confusion, doubt, anxiety, and uncertainty. Confronted by the Law, they can see only their sin, and if the Gospel does not follow they will be left in either despair or arrogance. Either they will conclude that it is impossible for them to be a Christian because of their own sins, or they will misuse the Law to justify themselves. Law and Gospel are properly distinguished to guard against both despair and arrogance. Only when the Law is properly distinguished from the Gospel are we able to see that while the Law does not save it shows us God’s will for the lives of His human creatures in creation. Why did pastors drift away from this clear distinction between Law and Gospel? Martin Luther once commented that the distinction between the Law and the Gospel is a most difficult art taught only by the Holy Spirit in the school of experience. Sometimes pastors are tempted to take what they perceive as an easier path, reducing preaching into a generic declaration of God’s love without regard to sin and the Law. Others might, in frustration over the spiritual apathy of their people or the moral chaos of our decadent culture, wrongly conclude that stronger and stricter application of the Law will change things. Both of these approaches bypass the arduous work required of those who would rightly handle the Word of truth. It is the hope of the editors of The Necessary Distinction that our book would challenge and encourage pastors both in the work of preaching and pastoral care. Like any good art, it must be honed, sharpened, and practiced. We believe that this book will help refine that art. Where the art of distinguishing Law and Gospel properly is put into play, preachers will avoid the notion that the Law is just preached to make people feel guilty and the Gospel is then proclaimed to make the guilty feel good about themselves. When the Law is preached incisively as the prophet Nathan preached it to David (see 2 Samuel 12:1–15), it functions as a mirror to show us the reality of our sin so that our hearts are open to God’s Gospel, which declares the forgiveness of sins, imparting the power of the resurrection for a new life in Christ. The authors of The Necessary Distinction demonstrate that there is nothing formulaic about this functional use of God’s Law and Gospel. How does the failure to properly distinguish Law from Gospel affect the Church’s mission, the carrying out of His mandate to make disciples of all nations by baptizing and teaching? Genuine mission work requires the preaching of both the Law and the Gospel. The Law identifies and crushes whatever false gods the human heart is looking to for meaning, security, and direction. The Law, however, does not have the capacity to restore broken sinners to life with Gospel. Only the Gospel creates Christians; it is exclusively the Gospel that is the power of God for salvation (see Romans 1:16–17). The Law brings about the knowledge of sin, but no human being will be declared righteous by the Law (see Romans 3:20). We proclaim God’s Law not to make disciples but to show how people of whatever background have sinned and fall short of His glory. But the word that makes disciples is the word of the cross, the good news of forgiveness of sins through the reconciling work of Christ. In your opinion, would a resurgence of (or return to) the proper distinction between Law and Gospel help to reunite the Christian Church? If so, how? Every division among Christians can, in one way or another, be traced to a confusion of Law and Gospel. The great Lutheran theologian of the last century Franz Pieper once commented that there are finally only two religions in all the world—the religion of the Law and that of the Gospel. As the Augsburg Confession reminds us, it is sufficient for the true unity of the Church that the Gospel be preached purely and the Sacraments be administered according to this divine Word. The Gospel is not preached purely if it is mixed with the Law. If the Law is dismissed, there is no need for the Gospel, which alone unifies the Church. How could a congregation be impacted by a return to a clear distinction between Law and Gospel? To order The Necessary Distinction, visit cph.org or contact CPH at 800-325-3040. The faithful practice of closed Communion is challenged in our day both culturally and ecclesiastically. As Western culture continues to careen down a path of individualism and autonomy, the privatization of faith leads many to regard participation in the Sacrament as a matter of personal entitlement. But the issue of admission to the Lord’s Supper is neither a matter of personal entitlement nor of being a welcoming and affirming church. Rather, it is a matter of both the nature of the Sacrament and the character of the Church. In Closed Communion? Admission to the Lord’s Supper in Biblical Lutheran Perspective, Rev. 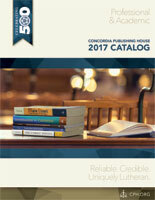 Dr. Matthew C. Harrison, president of the Lutheran Church–Missouri Synod, and John T. Pless bring essays together to bear testimony to the common Lutheran conviction that one cannot with integrity move from altar to altar where contradictory confessions are made—a testimony that has increasingly come under attack in even conservative Lutheran churches. This collection of essays will serve to assist both pastors and laity in understanding the biblical and confessional basis for closed Communion. Closed Communion? will be available for purchase October 18, 2017. In the face of attacks against Luther, the Lutheran Church, and the Reformation, the Church as a whole must be equipped to intelligently address these modern criticisms. Defending Luther’s Reformation: The Ongoing Significance of the Reformation at the 500th Anniversary of the Ninety-five Theses, is an anthology of essays that will do just that. Defending Luther’s Reformation will assist Lutherans and other Christians in grasping the significance of Martin Luther and the evangelical movement he initiated for the shaping of Christianity and, in particular, the teaching and practices of the Evangelical Lutheran Church since its confessional formation in the sixteenth century. It will equip readers to defend the existence of Lutheranism as a confession, dealing with the successes and failures of the Lutheran Reformation in achieving its goals of reform in doctrine and piety, and to assess controversial views of Martin Luther that were either broadly received into later confessional Lutheranism or either ignored or rejected. Defending Luther’s Reformation will be available for purchase October 3, 2017.